that it has some of the most expensive fashion in the world. It could compare to South Beach any day with prices and style. It’s also the biggest city in North Italy and the financial capitol of Italy. 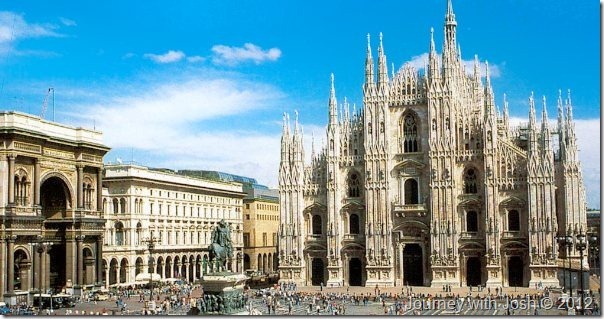 Milan is not only a city with a bank on every corner, there are plenty of museums and monuments of old to see and enjoy. I was pleasantly surprised. Let me say from the beginning that Rick Steves’ travel guides are by far the best in the world and always a handy reference for any trip to Europe. 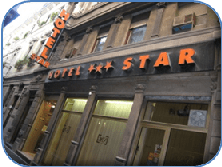 We made our way to our hotel, the Hotel Star. Most European hotels are a bit smaller than what Americans are used to. Also, their “star” rating system has nothing to do with how good the hotel is, just what amenities the hotel has such as an in-room bathroom. Ours was a 3 star and I enjoyed it very much. We always do our research before booking hotels in Europe. I don’t do shared bathrooms and in the summer, air conditioning is a must. Our hotel was perfectly located just two blocks from the Duomo Cathedral. added to the intrigue. The Duomo is a very large collection of spires, ornate statues and gargoyles held up by columns the size of redwoods and great arches overhead. The inside was as cavernous as any cathedral hundreds of years old would be. Stained glass climbed each wall with multicolored sparkles dancing together to combine into Biblical images and scenes. The stained glass windows in churches are always a favorite of mine. 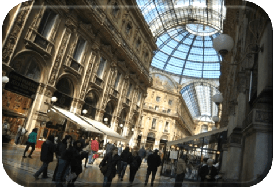 We then walked through the Galleria Vittorio Emanuele II which is a massive upscale mall with McDonald’s probably having the most reasonable prices of all the stores there. After our relatively quick stroll, it was time for dinner. 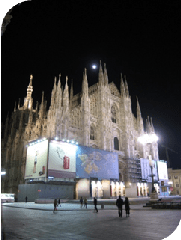 Unlike many other cities in Europe, people in Milan don’t necessarily eat at 10pm or later. As a matter of fact, they eat very much like we in America do at reasonable hours. They also have this great thing called aperitivo. Aperitivo is a great way to sample Italian foods and even a great dinner. You pay for a cocktail and eat all you want from the buffet. This is basically a “happy hour” and many of the locals take full advantage of it. We took Rick Steves’ advice and chose to go to Trattoria Dell’Angolo. It is small and homey and filled with Italian class and ambiance. With the French couple on one side of us cuddling, kissing and being nauseatingly loving and the large carafe of Pinot Grigio wine we ordered, the mood was set. The carafe of wine helped us stomach our neighboring couple, but it was sweet and romantic. Our feast consisted of Osso bucco & Risotto alla Milanese, and on my plate, Cottoleta alla Milanese. After dinner, we leisurely strolled back to the hotel to get rest for the next day’s trip to Venice. Friday’s adventure began with two cappuccinos and a sandwich and then we were off to Stazione Centrale headed to Venice, Italy. Taking the train to other cities in Europe is very easy and can lead to a great adventure if only because you get to see life and countryside outside of the cities. Riding on the train, in the distance you can see the start of the Alps which extend around to the Dolomites. Snow capped mountains surround our view and run alongside us nearly the entire train ride to Venice. You get to see places like where they mine the marble for all of the monuments and buildings in the cities of Italy. Chunks of the hills are eaten away to provide the beautiful stone that builds these great European cities; or the many small vineyards just beginning to turn green in the spring warmth. Venice is a spectacular city but more reminds me of a Universal Studios back lot. It is everything I expected yet not what I expected. I try these days to not have expectations because you can be easily disappointed but this wasn’t any disappointment, just different. 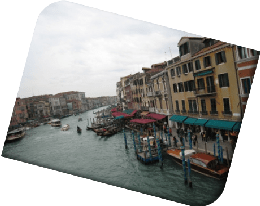 At first arrival, we rode the water bus to St. Mark’s Square. It was a leisurely stop-and-go trip that really gives you a chance to see the failing architecture that one day will be engulfed by the rising waters. Venice is a city that is very macabre. And that is the only way I could describe it. It is the epitome of macabre reminding me of scenes from Phantom of the Opera or old Edgar Allen Poe movies with Vincent Price. Once at Basilica di San Marco, I was dumbfounded by the amount of tourists that filled this gray concrete mass. The cathedral is beautiful and old. The doorways are decorated with multicolored frescoes and the large dome can be seen above most other buildings. After lunch we strolled down the narrow medieval streets until the cold finally took its toll. The buildings began to look alike and we had pretty much seen what we set out to. Although a fantastic place for some, it is a good quick day-trip for me. I’m beginning to wonder if it isn’t the weight of the tourists making Venice sink. Sforzesco is massive and given the time, you could explore for a couple of hours. Construction of the castle began in the mid 1300’s however only years later was it finished. And then it saw demolition and bombings from wars and many restorations. We chose to walk straight through to Parco Sempione which was beautiful and tipped with the hint of spring colors. As you exit the castle you’re greeted by a makeshift market with fake name brand wear including hand bags and belts. A typical sight in Europe made a bit uncomfortable with the narrow passage of illegal items and their sellers. Buying from them can land you in the Italian pokey. which had a surprisingly large number of cars navigating them. A very small town, Varenna is very picturesque with a ferry dock just centered. That was the reason for all the cars traveling back and forth. We were beginning to get hungry and we stopped by the Victoria Grill at the Hotel Royal Victoria. They had a generous menu with pizzas from €6,50 to full meals at €19,00 ($10- $23). After our lunch, we continued our walk by the water taking in the beauty of this place, a world away from the bustling city of Milano. Varenna is a great day-trip from Milan. Train fare is only €4,95 each way and only about an hour away, it is not only cheap but an easy get-away. Varenna gives you the beauty of Lake Como without the crowds of the city of Como. Varenna was a perfect end to a wonderful trip to Northern Italy.